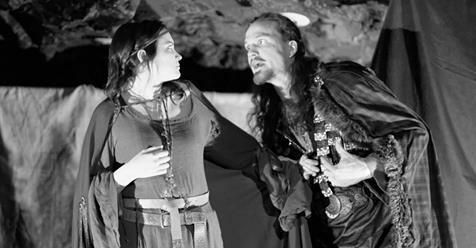 Review: Macbeth by Much Ado About Theatre. – East Midlands Theatre. 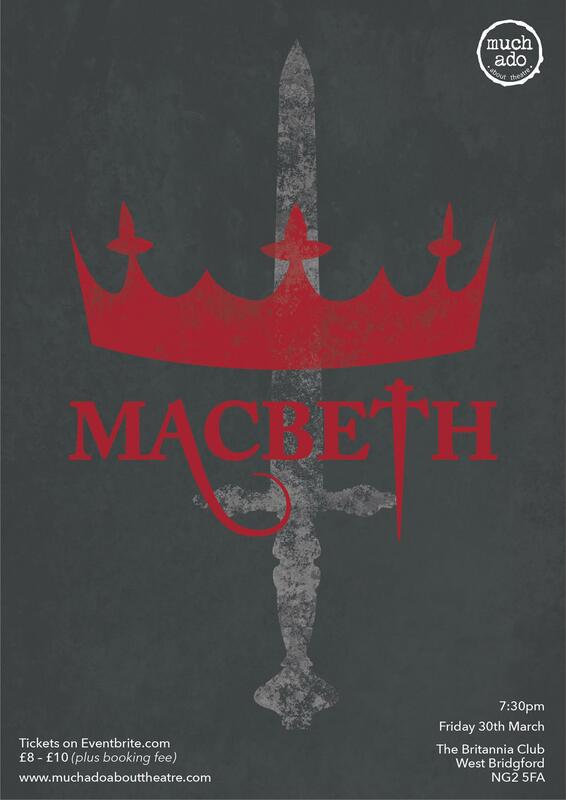 Macbeth is one of Shakespeare’s shortest plays and it is striking how quickly it leaps to the heart of the action. Within a few lines the weird sisters, or witches, are predicting Macbeth’s future and events are set in motion. There is little distraction from the drive for bloodlust and power and this singularity makes it all the more raw. This production, with its bleak and simple setting, highlights the fatalistic momentum of the play. Much Ado About Theatre creates a real ensemble piece, with just nine actors covering many roles effectively. James Parnham plays a thoughtful and trusting Banquo with ease, his diction and understanding of the language clear and commanding. Guy Evans as King Duncan has a natural stage presence and extracts meaning from every word. Malcolm, Macduff, and a host of other smaller male roles are presented with clarity and precision by Konrad Skubis and Alex Doddy. The aforementioned witches slither through the audience at the beginning, sending a shiver down the spine with their disconcerting hissing and giggling, and lending an unpredictable air to events. These hags, played by Emily Hall, Chloe Crump and Jennifer Reckless, also double as murderers and do well to create contrasting characters. The guts of the play, however, lie with Macbeth and his manipulative wife. Peter Radford as Macbeth is simply superb. Macbeth’s metamorphosis from noble soldier to ambitious murderer is entirely convincing through Radford’s intelligent interpretation of the text. There is variation in tone and speed, every expression shines through his eyes and is refracted through his body. He rails, he begs, he commands and he trembles, often within seconds of each other and it is clear he is a man on the brink of reason. This is a performance par excellence. Macbeth’s emotion and passion is contrasted with the cool and calculating Lady Macbeth. Sylvia Robson plays the role with restrain and detachment, only really unleashing the full emotion in her final scene, uttering those desperate words ‘Out, out damned spot’. Here she shows the unravelling mind with conviction. It’s brave, bold and bloody. The setting of Macbeth at the Nottingham Britannia Rowing Club is certainly an unusual one but works perfectly for this play. The Brit Club is styled like a cave, complete with stalactites and stalagmites. It is gloomy and oppressive, certainly when lit only with green and red lights, and is well suited to the dark tenor of Macbeth. Whilst the stage area is small, the company makes the most of the walkways and floor area to expand the action, often interacting with the audience to comic, and sometimes uncomfortable, effect. The lighting is simple but effective, with a red light indicating the bloodied hands. The costumes are outstanding in their period detail and really lend an authenticity to the production. Shakespeare is always challenging, the language complex, the ideas and references often not understood by modern audiences. But the stories are timeless, the humanity, the tragedy is universal, and conveying the heart of the piece therefore the priority. Much Ado About Theatre, under the direction of Becky Clayden, shines a light on this calamitous tale, with an astute knowledge of the text, finely honed acting and an instinctive feel for what will connect with an audience. It’s brave, bold and bloody.